Family traditions are important to me, especially now that my family includes only Wayne and me. Christmas has always been a time to remember our heritage. I just finished making my favourite Xmas cookies and wanted to share this post again for my new readers. Grandma's family came from Norway by ship and through Ellis Island. Her father (Swedish) was a chef, and was sponsored by the Adventist church to work at the Kellogg Sanitarium in Battle Creek, Michigan. Grandma's Aunt Mary (from her dad's Swedish side) served as a missionary in South America, but often visited at Christmas when my mom was young. 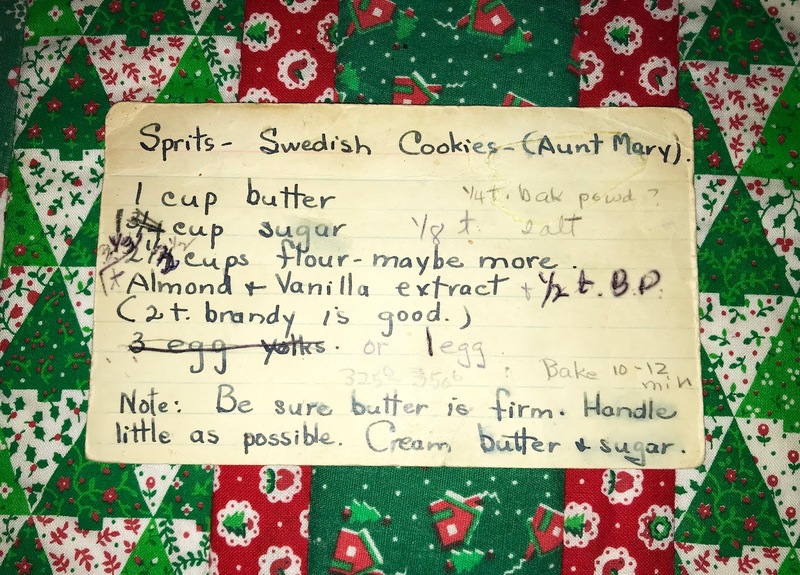 Along with amazing tales of living in a far off country, she brought her Swedish baking skills for holiday goodies. Be sure the butter is firm and do not make on a warm day. Handle as little as possible. Cream butter and sugar. Mix in egg and flavourings. Add flour, salt, and baking powder. Don't overwork! Place dough in a cookie press. Press cookies onto a sheet and bake in a 335 degree oven for 10-12 minutes, or until the edges are golden brown. I used to make these every Christmas using the old press that had a handle like a hose and you wound it. We have lots of stencils to put in it and I always made a batch of blue camels. I have no idea why blue, but that's what I did as a kid so any time I make them, I still have blue camels. I found one that is like a gun at a garage sale but I've never used it yet. They look the perfect Christmas indulgence. The recipe card is a family treasure. Wishing you and your family a very happy Christmas. 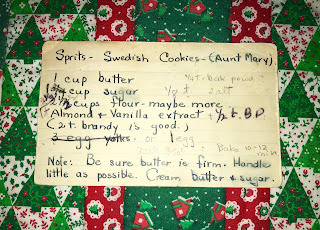 Those Swedish Spritz cookies look like what I know from Holland as spritz cookies. They have a buttery flavor. Thank yous for coming by my blog - have a merry Christmas! By the way, the trip around the globe was not my niece's honeymoon. For the latter they went to Egypt (a last minute change otherwise they would have been in the tsunami of SE Asia! ).